Hi. My name is Carole and I’m a sock knitting addict. All you other sock knitting addicts out there – and you know who you are – should be raising your hand right now and saying, “Hi, Carole.” This is the part of SKA where I tell you my story so just sit back and relax. 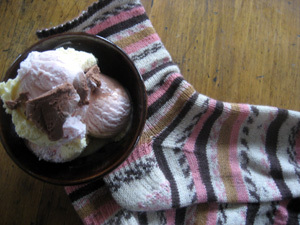 On Saturday I finished my Trekking Ice Cream Socks. Aren’t they pretty? Ooooh, the colors. Too bad this color combo (#126) has been discontinued. I found it on ebay, though, and you probably could, too. These are my standard 72 stitch picot edge stockinette socks knit on size 0s. They fit me perfectly every time, even if they do take forever and a day. 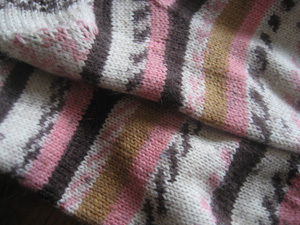 Anyway, I finished these on Saturday and decided to give the sock knitting a rest. After all, I’ve finished two rounds of sock madness in the last few weeks and the sock knitting has been a bit intense around here as a result. Round Three starts tomorrow and I thought a few days rest from socks would be a good plan. Smart, right? Ahem. I lasted until Monday afternoon and then I caved and wound up this Schaefer Anne and started the socks for my Bloomin’ Feet pal. 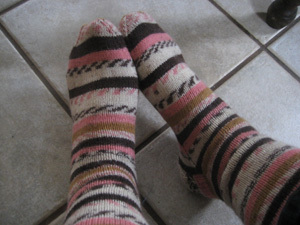 I simply cannot be without socks on the needles. Hi Carole. My name is Theresa, and I’m also a sock knitting addict. Hi Carole! This is actually a big step for me, coming right out and saying I’m a sock addict, because I was not for so long, and then after I become one I denied it for so long…and now I’m learning to accept it. And be proud. And love what it has done for my sock drawer. I’ll have to look for that Trekking on ebay…isn’t this the Brach’s candy looking yarn? or are there two out there? I have DH’s brown dress socks still on the needles, with some new yarns in the queue…Koigu and Claudia’s, and I’ve not worked with either before. I need to wind them. Feeling….urge…..to go to….LYS…..to wind…don’t have….swift and ball winder…of my own….help me…. Hiya Carole! Me too. Don’t make us all start a 12-step program, OK? I love your socks. They look like those coconut neopolitan candies too. Hi Carole, my name is Meg C. and I am a sock knitting addict too. It has been 2 mintues since I last knit on a sock. Is it wrong that I don’t want help? I only wish I was addicted to finishing socks (or anything else)! 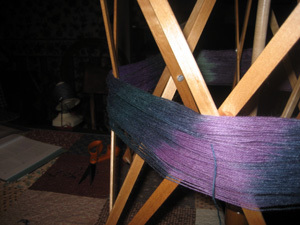 I’ve seen that Trekking yarn at Renaissance Yarns in Kent, WA–I think that they have quite a bit of it. That is Kim falling over…….you are really cranking these socks out!! The ice cream socks are very pretty! They match impressively. I can’t imagine not having a pair of socks on the needles. I’m just trying to get it down to one pair in progress. I love me a 72-stitch, picot-edge sock. You can’t go wrong. 🙂 And these are adorable–so matchy! 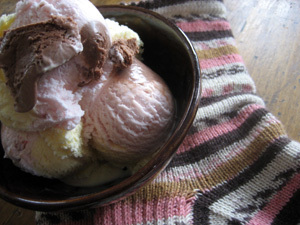 I love that your socks match your ice cream perfectly! 🙂 And I’m just like you, I feel weird without at least one pair on the needles no matter what else I’m going. It’s good you can admit your problem. There is no cure, but you’re not alone. But you already know I’m a sock addict. It seems that when I *do* post, which isn’t frequent enough, it’s all about socks! Those Neopolitan socks are great!